The premise is really quite simple: a dental implant is surgically embedded in your jaw at the spot where there was once a tooth. Made of titanium, a biocompatible metal, the implant integrates with the surrounding bone structure. In fact, the process is called osseointegration, bone + integration. Once the implanted post and bone have fully fused, Dr. Holcomb attaches a tooth restoration, which can be a porcelain crown for a single tooth replacement or a crown and bridge, partial or implant-retained dentures for several missing teeth. In addition to offering security when you bite or chew, dental implants offer a number of other benefits. Without a tooth root to stimulate a healthy jaw, the bone begins to deteriorate. As a result, the structure of the face can change, giving a person a sunken and haggard appearance. A dental implant takes the place of that missing root and encourages health bone growth that maintains a more youthful appearance. 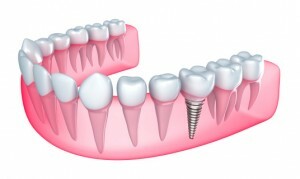 In addition, a dental implant helps keep surrounding teeth in their proper place. Teeth need each other to remain correctly positioned—one tooth aligns the next and so on. A missing tooth can cause surrounding teeth to shift, which may impact your bite. Finally, there is the cosmetic advantage of dental implants. A missing tooth is actually hard to miss; you and everyone can see that gap in your smile. Some people even avoid speaking, smiling or laughing because they know what others will see. A dental implant supports a very natural looking tooth restoration so you once again have confidence around other people. For dental implants, Collierville, TN, residents trust the expertise of Dr. Joshua Holcomb. If you are dealing with challenges of missing teeth, call our office today to schedule a consultation. Our state-of-the-art dental practice warmly welcomes patients from all of the surrounding areas, including Pembrook, Germantown, Bartlett, Memphis, Olive Branch, and beyond.